Last week, I attended the 2018 Entomological Collections Management Workshop, held at the California Academy of Sciences (CAS) in San Francisco, California. This was an intensive 4-day workshop run by the Entomological Collections Network (ECN) aimed at educating and training both current and future managers of insect collections. 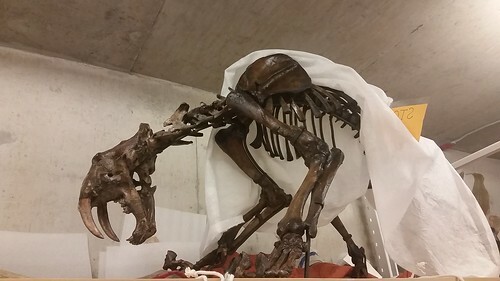 Topics included profiling and assessing collections, writing plans and mission statements, managing museum pests, packing & shipping specimens, supervising museum staff, digitizing and georeferencing specimens, and much, much more. We covered an impressive amount of material in four days, considering that we could have easily spent entire semesters on some of the topics. We were certainly not left lacking—each museum participant was sent home with a flash drive with hundreds of additional resources. I certainly have a lot more reading to do…. As part of the workshop, we learned how to package specimens for shipment. To test how well we did, we threw our boxes off of a three-story building. These specimens survived! Photo by Carolyn Trietsch (CC BY 2.0). Click for source. 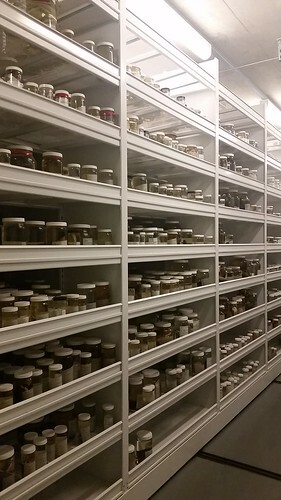 Regardless of a collection’s size, scope or regional focus, all natural history collections are irreplaceable resources that are important on a local, national and international scale. Natural history collections can be used in many, many different ways; not only are they valuable for research and education, but also for environmental and conservation planning, resource management and allocation, and public policy and decision making. Collection managers are curators, supervisors, building managers, storytellers, exhibit designers, administrators, and more. To do these tasks effectively, they must know a little bit about everything. It’s easy to get caught up in different aspects of the job, but collection managers must never lose sight of the most important thing: the collection. Collection management is a balancing act between preserving specimens and allowing them to be used and accessed for research or education. Collection managers have to know the needs of the collection as well as the needs of those using the collection, whether for research or other reasons. As much as you want to please everyone, sometimes it is necessary to say no, whether it concerns accepting a donation of specimens that does not match the aims of your collection, or a request for destructive DNA extraction on specimens that cannot be replaced. Collection managers must strive to find the balance between protecting the collection and allowing it to be used. The ethanol collection at the California Academy of Sciences. There are many things that collection managers must take into consideration when planning space for a collection such as this. Each shelf has a bar to prevent jars from falling off in the event of an earthquake, which is more likely in San Francisco than in State College, PA. The fire system in this room is also very sensitive (important for when your collection is highly flammable), and will fill the room with a dense fog at the first detection of smoke or heat. Photo by Carolyn Trietsch (CC BY 2.0). Click for source. It is important to track how your collection is used. Every bit of data you can collect will help you convince administrators that your collection is important and worthy of funding. Some of the things that can be recorded include: the number of resident researchers, students, and volunteers working with the collection; the number of visitors a year, and how many tours were given; the number of papers published using specimens from the collection; the number of loans and acquisitions; even the number of emails or phone calls you get expressing interest in the collection! One handy tip from the workshop was to keep a counter handy at public outreach events so you can keep track of how many people you talk to and educate about the collection. Another handy tip was to keep a logbook available in the collection for visitors to write in. Any activity you track can help prove to others how useful collections are, and help prevent your collection from becoming orphaned in the future. As part of the workshop, we toured collections of invertebrates, vertebrates, fossils, and plants, not just for the spectacle but because any entomology collection manager will be working with other collection managers, who may have different needs or concerns based on the specimens they have and the ways those specimens are preserved. Other collection managers may have goals that align with or contradict your own; it is important to understand how their collections operate and how their needs differ from yours so you can work to resolve any potential issues that arise, such as with space for the collection (“space wars”) or chemical safety (for example, some taxidermied vertebrates were preserved with arsenic and are dangerous to touch). As part of the workshop, we toured several types of collections, including collections of fossils. Check out this saber-toothed tiger (Smiledon) fossil pulled from the La Brea Tar Pits. Photo by Carolyn Trietsch (CC BY 2.0). Click for source. 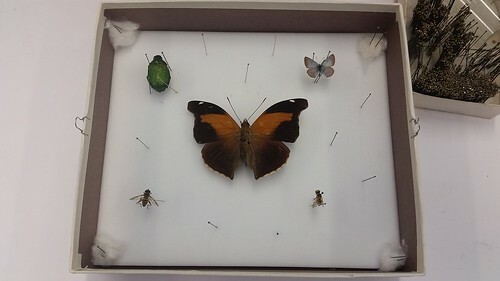 There are challenges associated with using specimens in exhibits. These include exposing specimens to damaging conditions such as light, temperature and humidity fluctuations, and the unavoidable hazard of small children touching and banging on the exhibits. You should never subject research specimens to these conditions—instead, have a separate teaching or outreach collection you can take specimens from. Also, when designing an exhibit, decide what the aim of the exhibit is and make sure each component fits in with the overall theme. Each exhibit should tell a story to the visitors that they can walk away with and pass onto others. Collection managers often serve as the public face of the museum. Collection managers are the ones who will be giving tours, participating in outreach, designing exhibits, interacting with traditional and social media outlets, and answering questions about the collection. Think about what the public is interested in (have “oh my” stories or specimens ready; anything that makes people say “oh my”) and stay aware of current events—you will likely be asked about them. The public will likely ask questions about the collection and where the specimens came from; they may also ask questions about you and what your job is. Be patient and never say things that you know are wrong. If you’re asked a question you don’t know the answer to, tell them so, then look up the answer later and follow through with the person who asked it. They will respect that you were honest and took the time to follow through with them, and they will remember you for it. 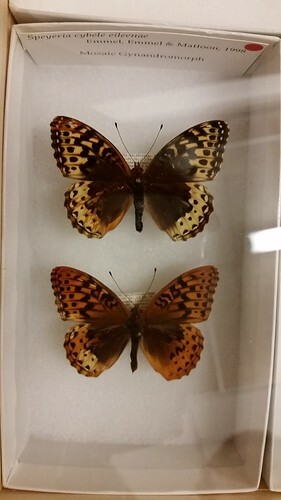 Some examples of “Oh my” specimens at the California Academy of Sciences– mosaic gynandromorphs (containing both male and female wing characteristics) of Speyeria cybele eileenae. Photo by Carolyn Trietsch (CC BY 2.0). Click for source. Though I have gained a lot of experience in imaging, digitizing and managing insect collections during my time at the Frost, the ECN collections management course helped me take this to the next level, gaining a broader view of the field and helping me to fill in the gaps in my knowledge. This course definitely helped me become a more capable and effective collection manager. The workshop was held at the California Academy of Sciences (CAS) in San Francisco, California. 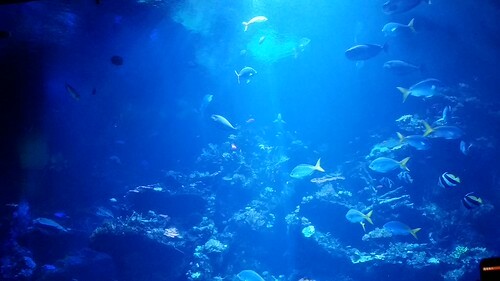 The museum has a huge public space, complete with an indoor 3-story rain forest and an aquarium including a network of interconnected coral reefs! Photo by Carolyn Trietsch (CC BY 2.0). Click for source. 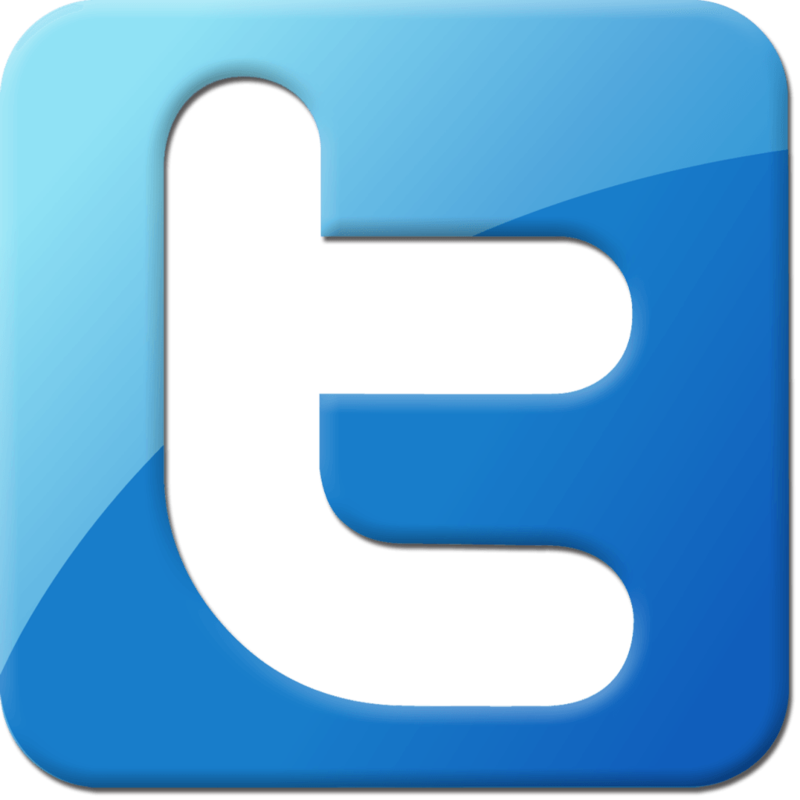 This entry was posted in curation, Digitization, news, outreach, research. Bookmark the permalink.